To be civilized involves, among other things, making, using, and buying objects. Although speculation on the significance of objects often tends to be casual, there are professionals--anthropologists, historians, semioticians, Marxists, sociologists, and psychologists--who analyze material culture in a systematic way and attempt to elicit from it reliable information about people, societies, and cultures. One reason that analyzing objects has been problematical for scholars is the lack of a sound methodology governing multidisciplinary research. Reading Matter addresses this problem by defining a comprehensive set of methodological approaches that can be used to analyze and interpret material culture and relate it to personality and society. Berger offers discussions of the main concepts found in semiotic, historical, anthropological, psychoanalytic, Marxist, and sociological analysis. He provides practical descriptions of the working methods of each discipline and demarcates their special areas of investigation. 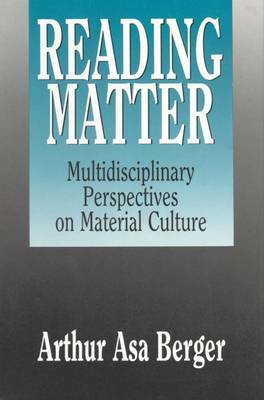 Berger's lively discussions include a wealth of illustrative examples that help to clarify the complex and often difficult theories that underlie interpretations of material culture. In the second part of his analysis, Berger uses these disciplines to investigate one subject--fashion and an important aspect of fashion, blue jeans, and what the author calls the "denimization" phenomenon. Here he shows how different methods of "reading" material culture end up with different perspectives on things--even when they are dealing with the same topic. The author's focus is on the material culture of post-literate societies and cultures, both contemporary and historical. This comparative approach enables the reader to trace the evolution of objects from past to present or to see how American artifacts spread to different cultures, acquiring a wholly new meaning in the process. Reading Matter is an important contribution to the study of popular culture and social history. It will be of interest to sociologists, anthropologists, and cultural historians.